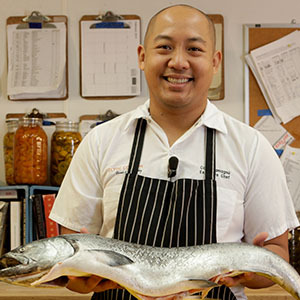 After growing up in the both the Philippines and the US, and working in in Europe and Asia, Chef Carlo Lamagna has a wide range of culinary influences. He serves as Executive Chef at Portland's diverse European style tavern, Clyde Common, which Zagat called a "hipster paradise attached to Portland's Ace Hotel" and was named one of 50 Best Bars in America by Food & Wine. At Clyde Common, Chef Carlo has revamped the menu, adding several popular sharable plates that encourage a more communal dining experience. Chef Carlo began his Culinary career in Detroit, working in several restaurants before attending the Culinary Institute of America in Hyde Park, New York. After culinary school, he worked in kitchens in France, Germany, and Spain. He served as Executive Chef at Michelin Star winning Chef Paul Virant's exceptional farm-to-table restaurant, Perennial Virant before joining the kitchen at Clyde Common in 2014. Chef Carlo draws inspiration from his extensive travels while cooking and strives to create unique, internationally inspired, modern food. Learn the basic anatomy of a hog, how to break it down, and which cooking methods are best suited to each cut. Learn how to choose the right vinegar for a dish based on the flavors and origins of different varieties. These pork and mushroom egg rolls are fried for a crisp exterior and served with a sweet and sour sauce. Working with fresh fish can be intimidating, but having the right knowledge about handling and safety can make it a simple and easy task. This traditional Filipino dish slowly simmers pork cheeks in vinegar, stock, and spices until they are full of flavor. With a little practice, this useful technique will help ensure that your roast cooks evenly every time.